Start by taking the hot dogs and cutting them in half . Then split them down the middle. Place the cheese slice down the middle. Separate the crescent dough into triangles. 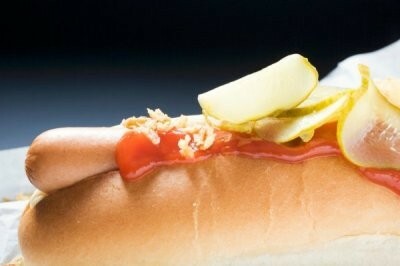 Wrap each dog -- starting on one end and stretching the dough slightly to cover as much of the hot dog as possible. Place hot dogs on foil-lined cookie sheet and bake at 400 degrees for 10-12 minutes or until golden brown. Serve with your favorite condiments. Cut frankfurters into bite-size pieces. Place pieces in crock pot. Combine remaining ingredients. Add barbeque sauce as needed for the size of your crock pot (**). Cook on low for 3-4 hrs or on high for 1-2 hrs. Serve from the crock-pot on low. Combine hot dogs, chopped onion, chili, and chili powder in the crock pot. Stir well. Cover and cook on low for 6-8 hrs., or on high 2-4 hrs. Just prior to serving, add cheese and let it melt a bit. Spoon sauce over hot dogs in buns. Arrange tortilla chips on a platter or in a casserole dish. Top the chips with the cooked chili dog topping. Cover the chili dog sauce with cheese. Melt cheese under hot broiler, 2 minutes, until melted and bubbly. Garnish with sour cream, salsa and chopped scallions. Boil a large pot of water for macaroni. Salt water and cook about 7 minutes until just under al dente in doneness. Preheat broiler and set rack 12 inches from heat. While pasta is cooking, heat a large deep nonstick skillet over medium-high heat. Add 1 tablespoon extra-virgin olive oil, then add hot dogs and brown on both sides, 4 minutes total. Remove the dogs with a slotted spoon to a paper towel lined plate. Add another tablespoon extra-virgin olive oil and the butter. When butter melts, cook onions 4 to 5 minutes, then add flour and cook another minute. Add beer and cook off completely, 1 minute. Whisk in milk and bring to a bubble, then season the sauce with salt and pepper and stir in the mustard and ketchup. Lower heat and add 2 cups of the cheese. Stir to melt, 1 minute. Adjust mustard, ketchup, and salt and pepper, to your taste. Drain pasta well. Combine pasta and hot dogs with sauce and coat evenly then pour into large casserole and top with remaining cheese. Melt and brown cheese under broiler, 2 minutes. Serve.